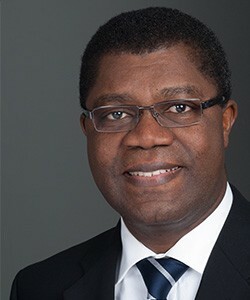 Thierry Zomahoun is the Founding Executive Director and currently President and CEO of African Institute for Mathematical Sciences (AIMS) Group. Thierry is leading the growth of Africa’s first and largest network of centers of excellence in mathematical sciences. Under his tenure, AIMS has grown into a global network of world-class scholars and academics from over 36 countries and a pan-African graduate body of hundreds of alumni from 41 African nationalities. Thierry is a graduate of the National University of Benin (Benin), McGill University and HEC Montreal (Canada) and of the University of Geneva (Switzerland).